Embroidered with silver-gilt and silver thread and coloured silks in underside couching and split stitch, with laid and couched work, on linen. English embroidery was an artistic product which achieved wide fame in the middle ages. It was in demand all over Europe and bought by princes and popes. Almost all the surviving embroidery is ecclesiastical. As it is usually pictorial, it can be compared closely with contemporary illuminated manuscripts and was often referred to in Latin, the language used in documents, as acupictura or painting with the needle. The highest quality examples were made in professional workshops between about 1250 and 1350. 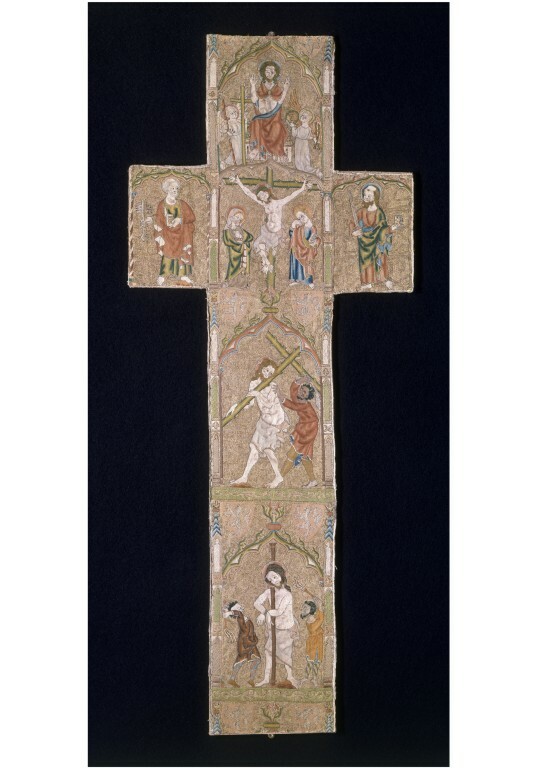 The detail here of Christ carrying the cross is from an orphrey, a decorative strip - in this case cross-shaped - which would originally have been sewn onto the back of a chasuble. This was the main garment worn by a priest for celebrating the Christian Mass. The rich and exquisite embroidery is worked in silver and silver-gilt thread and coloured silks on a linen background. Scenes of Christ's passion - his torture and crucifixion - are vividly portrayed, the contours of the faces formed by working spirals of stitches tightly so that the linen underneath was pulled into slight indentations. The scenes are framed by decorated arches in the style of the favoured Gothic architecture of the period. The decoration includes shields for the Wokyndon family, who were benefactors of St Paul's Cathedral. The will of Joan, widow of Sir Nicholas de Wokydon, dated 1322 is in the cathedral archives and she founded a chantry there. 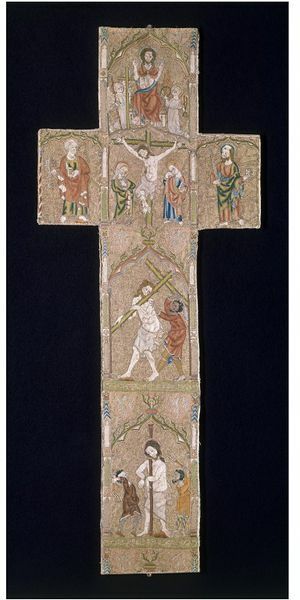 Orphrey pieces from the back and front of a chasuble, linen with embroidery in silver, silver-gilt and coloured silks. Mrs Grace Christie found the orphrey mounted on a 19th century chasuble and still in use in Marnhull, Dorset in 1935. At that stage she was working on a major publication on ecclesiastical embroidery. 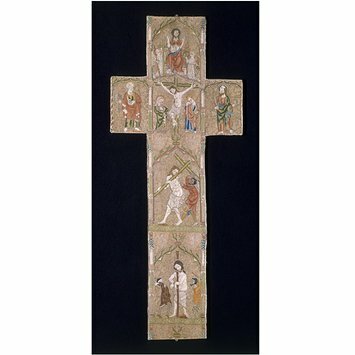 She recommended to Father William Moylan of Marnhull that he lend the orphrey to the Museum and that it be photographed. By 15 July, the Vicar General had given permission for the loan and photography and the possibility of the orphrey being available for purchase at some later date had been mooted; by 29 August a price was to be discussed; by 13 December permission had been granted for Mrs Christie to publish the embroidery in her forthcoming book. The Presbytery accepted that a price in line with that given for John of Thanet embroidery (T.337-1921) bought a decade earlier would be appropriate, and by 26 February 1936 was asking for £600-£700. On 18 June 1936 the NACF suggested an initial offer of £500 for the orphrey although they might be able to go up to £600. They wondered whether an external opinion beyond that of Mrs Christie should be sought on the condition of the object and suggested Sir William Burrell as an appropriate reviewer. Father Moylan accepted the £500 (24 June 1936). The money was to be invested for the Marnhull Mission. Orphrey bands from back and front of a chasuble, linen embroidered in coloured silks and metal thread, 1310-25. Alexander, Jonathan, and Paul Binski (eds. ), Age of Chivalry: Art in Plantagenet England 1200-1400, London: Weidenfeld and Nicholson, 1987. Purchased with the aid of the National Art-Collections Fund. Scenes from the Passion of Christ. The shields of arms are for Wokyndon.